Be the first to share your favorite memory, photo or story of Berniece . This memorial page is dedicated for family, friends and future generations to celebrate the life of their loved one. Bernie completed her final Christian journey on September 7, 2018 while living at Bethany Life Communities in Story City, Iowa. 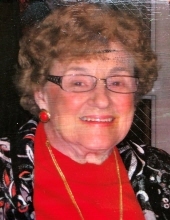 She was blessed to be in the company of such a loving staff and residents who became an extension of her family. She loved them all and they loved her. Bernice was born to Lawrence & Alma (Cramer) Schierbecker on August 3, 1925 in Centralia, Illinois. She spent her childhood growing up with a brother Duane and sister Jody. She graduated from Centralia High School and began working in the office of the Illinois Central Railroad. She was writing to a serviceman serving in WWII when one of the letters got to an Edward Boyer by mistake. He answered the letter and as they say…. The rest is history. Bernie and Ed were married in 1944. Bernie and Ed were blessed with a daughter Christine in 1949 and a son Timothy in 1955. They moved to Homewood, Illinois in 1953. The rest of Bernie’s core family also moved to Homewood Illinois and family life became rich in tradition of family dinners and coffee around a big kitchen table after church every Sunday. A career as a secretary and building manager at Churchill School in Homewood was a source of satisfaction and wonderful friendships for her. The “slosh group” as they called themselves were a strong source of fun and support, especially following the tragic death of Ed at only age 52. Those ladies carried each other and celebrated together for many years. Visiting grandchildren and later great grandchildren was her favorite travel. She made it to both grandson’s weddings in Texas and always looked forward to visits to Iowa by her grandsons and their families. The UNO cards always came out and the fun began! Not sure who had more fun the great grandchildren or Bernie! Bernie enjoyed movies, shopping, jewelry, playing cards, changing furniture around in her home (Ed called this “living room of the week”), chocolate, coconut cream pie, and polish sausage with sauerkraut. Her famous family recipe for macaroni salad continues to live on each time her children, nieces and grandchildren prepare it. Joyfully reuniting with Bernie in heaven are: her parents, husband Ed, her siblings and their spouses, nephew Larry, and her second husband Charles. What a celebration it must be for all of them to be together again. Bernie is remembered in the hearts of those she leaves behind: daughter Christine Timmons (Doug) of Ames; son Timothy Boyer (Adrienne) of Atlanta GA; grandson Daniel (Shalyn) Timmons, Jonah and Seth of Irving Texas; grandson Scott (Melanie) Timmons, Corinne and Keller of Arlington Texas; grandson Sam Boyer and granddaughter Becca Boyer of Atlanta, and many nieces and nephews. Graveside services will be at Hillcrest Cemetery in Centralia, Illinois on Saturday September 15, 2018 at 10:00 am. A memorial sharing service will be held the following week at Bethany Life Communities in Story City. To send flowers or a remembrance gift to the family of Berniece Marie Voldness, please visit our Tribute Store. "Email Address" would like to share the life celebration of Berniece Marie Voldness. Click on the "link" to go to share a favorite memory or leave a condolence message for the family.